Los Nevados is a national park located in the Cordillera Central of the Colombian Andes in the departments of Caldas, Risaralda, Quindio and Tolima. The park includes several thermal levels with the Andean forests, páramo, permanent snow and glaciers. It also includes the watersheds of some rivers, such as Otún, Totarito, Molinos, Azufrado, Lagunillas, Campoalegre and Guali, among others. 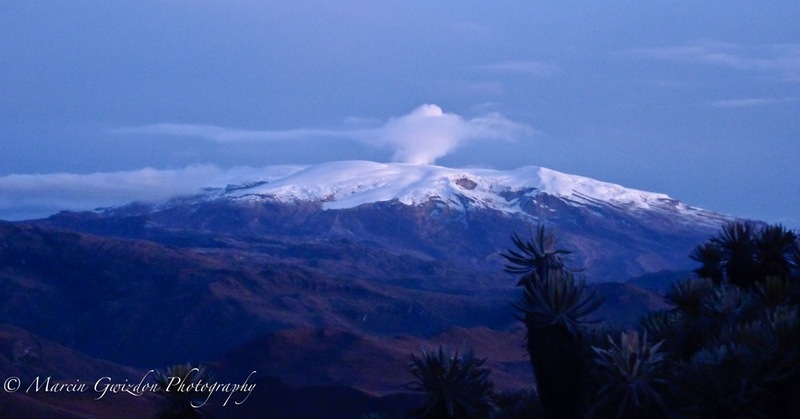 The highest peak of the park - an active volcano of Nevado del Ruiz (5,321m) lies in the northern part of the park and is accessible from Manizales. This part is run by “Concesion Nevados”, which in fact is the Aviatur travel agency. In reality, it means that the park is privatised and their main objective is to make as much profit out of it as possible. The southern part (accessible from Salento or Ibague) is less frequented and much more interesting. With the second-highest peak of the park - Nevado del Tolima (5,216m) it offers more routes, less crowds and a genuine feeling of remoteness. However, large sections of the trails here are in disrepair and one should take care when venturing into the higher parts of the mountains.